Bottle pourer. 296-50 spill stop Liqour Pourer. with attached bug/ dust cap- 12 per pk. Spill Stop is a name you can trust when it comes to bottle pourers and liqour pourers of all kinds. The new 296-50 is the famous 285-50 liqour pourer with an attached bug/dust cap. 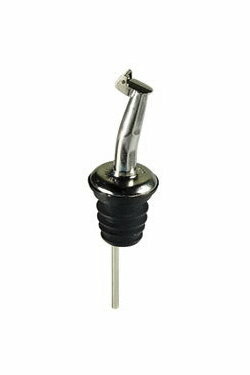 This pourer is made of metal with a reliable graduated fin rubber cork that fist securly into the bottle. the 296-50 bottle pourer is reliable enough for professional use as well as home bar. Sold in packages of 12, the 296-50 liqour pourer gives you the benefits of the Spill Stop technology with the added protection of the attached dust / bug cap.